The Police Chaplain Program creates a partnership with various faith-based leaders of a community to respond and assist police and other law enforcement agencies providing an overall better quality to the citizens of cities and communities. The goal is that by having the Police and Clergy working together during times of crisis or incidents, that a more comprehensive response will be given to those in need. The faith-based leaders will perform tasks of a more emotional, social or spiritual nature while the officers handles those tasks that are of a law enforcement nature. The role of the Chaplain is to be the ‘balancer.’ The Police Chaplain is to provide support for Police Officer and civilians in their needs. Chaplains are there to provide appropriate assistance, advice, comfort, counsel and referrals to those in need who may request support. 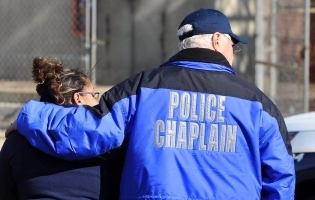 The Police Chaplain Program provides promotion, training, consultation and encouragement to chaplains, the law enforcement and first responder community.